Dusty May has accepted the challenge of building Florida Atlantic University’s men’s basketball program into a team that will consistently compete on the national stage. May has been named Florida Atlantic’s new head men’s basketball coach after signing a five-year contract today. He will be introduced at a press conference on Friday, March 23, at 11 a.m. in the Founders’ Lounge of the Tom Oxley Athletic Center, located at 777 Glades Road on the Boca Raton campus. May joins FAU after three years as an assistant coach at the University of Florida, where he helped the Gators compile a 69-37 record, including back-to-back NCAA Tournament appearances. The Gators reached the second round of this year’s tournament after advancing to the Elite Eight in 2017. As a full-time assistant, May’s teams have compiled a 274-166 record (.623 winning percentage). 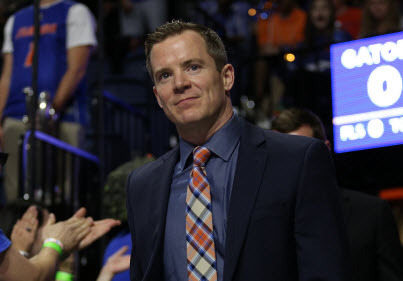 May, who is FAU’s ninth head men’s basketball coach, has spent the last seven seasons on the coaching staffs of Florida coach Mike White, first at Louisiana Tech University for four seasons and then with the Gators. White is the older brother of Brian White, who was named FAU’s vice president and director of athletics on March 3. May was retained as an assistant at Louisiana Tech when Mike White took over the program entering the 2011-12 season, and the Bulldogs won three straight conference championships – the Western Athletic Conference title in 2013 and Conference USA crowns in 2014 and 2015. In their first season in Gainesville, the Gators rebounded from a sub-.500 record to finish 21-15 and advance to the quarterfinals of the National Invitation Tournament. May served six seasons (2009-15) as assistant coach and associate head coach at Louisiana Tech. In his final season with the Bulldogs, the team went 27-9, including 15-3 in Conference USA to win the regular season championship by two games, and went 17-0 on its home court. Louisiana Tech won 49 of 50 home games from February 2012 through the end of the 2014-15 season. May was a student manager for the University of Indiana men’s basketball team and after graduating began his professional career as an administrative assistant/video coordinator at USC from 2000-02. He returned to Indiana in an administrative role for three seasons before taking his first step as an assistant coach with Eastern Michigan (2005-06). He has also served as an assistant at Murray State (2006-07) and the University of Alabama at Birmingham (2007-09). May and his wife, Anna, have three sons, Jack, Charlie and Eli.